Local course knowledge made all the difference for the Tom Marlowe Trophy winner at the Northwood fixture.Society secretary Garth Burden put his home advantage to good use in the “Summer Bonus” by scoring 40pts to register his first win for many years.The trophy, one of the Society’s oldest, marks the Daily Mail’s longest serving editor of 27 years from 1899 to 1926 who oversaw the rise of the newspaper under Lord Northcliffe.For Garth, winning the trophy was particularly significant as he had worked virtually all his journalistic career on the Daily Mail editorial. That was the good news for him. The bad news was that under the Society’s handicapping rules, he was cut three shots for his win so that he now has to play off 11 for his next three fixtures. 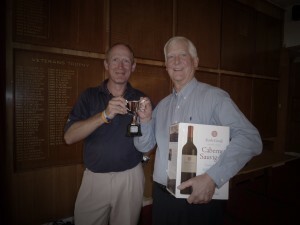 The trophy was presented by Clive Heard from dmg media finance who stood in as Captain of the Day and then it was Clive’s turn to receive a prize as he was runner-up in the competition with 37 points and was cut one shot to seven. Close up in third place was Jobsite’s Mike Wall with 36 points who beat Metro’s Luke Glover on countback. This “Summer Bonus” was added to the fixture list by popular demand and the course was in great condition for the 22 players. Everyone agreed that the day had been a great success and Northwood will be added to next year’s fixture list for a July meeting. The afternoon greensomes competition saw the Mail on Sunday pairing of John Morgan and Ian McIlgorm win with 42 points with former Daily Mail executive Barry Edwards and guest Howard Spencer in second place with 39 points, just beating the Society’s Handicapping guru Ian McGowan and Jobsite’s Jonathan Brooke who were third on countback with 38 points. Nearest the Pin on the third was won by guest Howard Spencer and on the 15th by former Daily Mail sports editor Tom Clarke. With a roll over from the previous Royal Cinque Ports meeting there was £180 in the “Back the Winner” Competition with both Garth and Ian McIlgorm who wisely decided that home advantage could play a part in the competition winning £60 each and £60 going into the funds. There were two winners in the “2’s” competition with Ian McGowan and Luke Glover received £15 each and £14 going into the funds.